Garrett, J. J. (2003). The elements of user experience: User-centered design for the web. New York: American Institute of Graphic Arts. 208 pages. Garrett is a user experience designer and is the president and co-founders of Adaptive Path. This book provides an effective introductory overview of user experience design for a general audience, but it would be particularly useful for new professionals and hiring managers. Garrett anchors user experience design to five inter-related elements that provide a conceptual framework for talking about user experience, problems that user experience projects often encounter, and various methods of solving those problems. These elements are: Strategy (site objectives and user needs), scope (functional specifications and content requirements), structure (interaction design and information architecture), skeleton (interface design, navigation design, and information design), and surface (visual design). 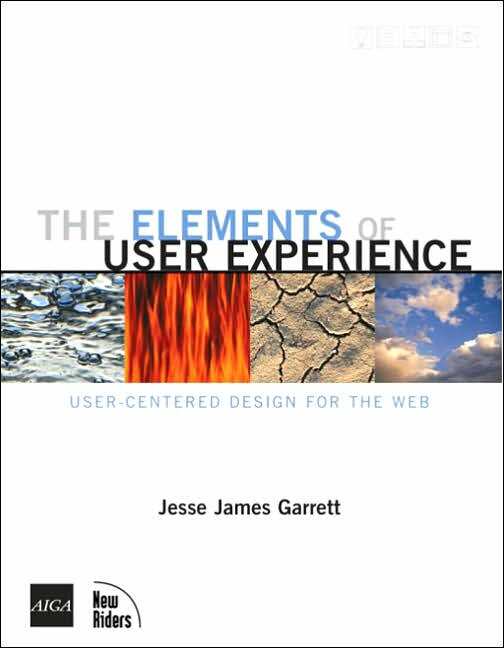 Though the organization of this book centers on Garrett’s “five elements,” the content is applicable to the user experience field at-large and focuses on meeting business goals while also advocating for user needs. This book provides a good overview of the user experience field and a helpful guide for new professionals planning their first major projects. Readers seeking in-depth or theoretical information will not find it here.